Achievement & a Three Quarter! Besides South Africa's unthinkable act this morning, there was something else that happened in the cricket world that took me by surprise. Kevin Pietersen scored a 100. That's not what surprised me. What did though was the fact that it was KP's 15th test century. That's what I shouted in my head. He played his 1st test only 3 years ago, and he's already scored 15 tons? That shook me up for a bit. So KP's been on the scene for 3 and a half years now. In 45 tests, this is his 15th century - thats 1 every 3 matches! Thats quite a conversion rate. Sehwag also has 15, but in 66 matches - 21 more matches than KP's. Or to put it more aptly, in 30 more innings. Alec Stewart took 152 innings more than KP's 83 to score the same number of centuries. Remember Stewart, the England wicket keeper batsman? Atherton and Ganguly have each scored 1 more century than KP in 129 and 102 more innings respectively. Hell King Sanga has scored only 2 more in 42 more innings and compared to KP he's been around forever. Yes yes I logged on to Cricinfo, but thats what 15 centuries in 45 tests demanded of me! Well ofcourse. Sir Don Bradman has. 29 centuries in only 52 matches and 81 innings - 3 less than KP's. The Great West Indian Clyde Walcott also had 15 test centuries and he got them in only 74 innings in 44 tests. Apart from them though, KP has bettered them all. He has scored test centuries faster than Ricky Ponting. Faster than Mohammad Yousuf. Faster than Matthew Hayden. Above all, faster than Gary Sobers! You know what I mean by faster. Thats an achievement and a half. Whats more, KP's centuries have come against the best. He hasn't played a test against Bangladesh or Zimbabwe, so no one can say he got easy runs. He has knocked tons against all 7 major test playing countries and he has scored them all over the world. In Australia, in India, in Pakistan, in New Zealand, everywhere he has played (besides Sri Lanka). And he is yet to play a test in South Africa, but he has 2 100s against them, scored in England. 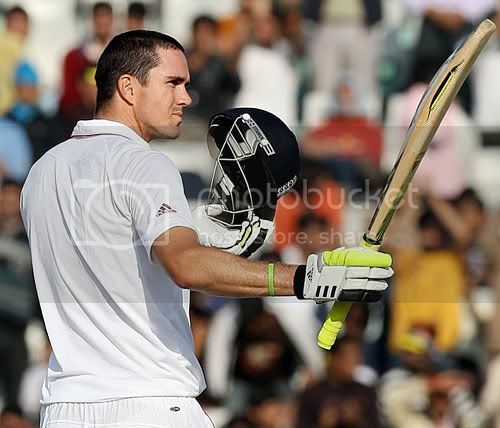 KP has 3 centuries against India and 2 against each of the other 6 major test playing countries. Achievement and a three quarters I reckon! good one Q. bet even KP didn't put so much thought into his 100s. Great... it struck me too when the commies mentioned that it was his fifteenth. Unassumingly, this guy could finish way on top. I've been saying KP is a legend since he made his Test debut against us in 2005. He's easily my favourite batsman in world cricket today. (Sorry to the Sehwag fans, I like KP better....) He does well on my adjusted averages as well, just behind Ponting amongst current batsmen. I agree Scorps.. he very well could..
you were one of the first to say so DB, I remember. As scorps says, he really might end up on top.. The boy's got serious talent, and will get better. Which is scary. His current form doesn't justify the stature you are willing to give him. His 11 centuries were made at home the one he made against Pakistan he was given three lives by the umpires. I don't think he is better or even close to Sehwag. Suave, scary or worth a watch? Wasim, I differ. He's very young and has a long way to go. And as Suave said, his best is yet to come. That is surprising, even though most things about KP shouldn't really surprise anymore. The guy is special no doubt about it, but I'm surprised so few people have picked on the fact that he's reached 15 so quickly (and easily to be honest). Achettup, the fact that KP has risen through the ranks so rapidly, it doesn't surprise me that his achievements haven't been noticed by many or that many sit up and are amazed at what this man has done in such quick time..